Solar thermal collectors convert solar radiation to thermal energy and most people are familiar with flat-plate collectors located on roofs to provide solar hot water and heating for the home. Generally, the glass used to seal and cover the absorber plate and pipes inside is often of a low iron-oxide type that is anti-reflective to reduce absorptive and reflective losses. Whatever the type of glass or treatment of the glass is used, the use of a cover glass reduces the transmission of solar radiation to the absorber plate reducing its efficiency. But we can greatly improve the amount of energy absorption by means of concentrating and intensifying more sunlight onto the solar collector by using a technique called Concentrated Solar Power. Concentrated Solar Power or CSP for short, uses mirrors, reflectors or lenses to concentrate the sun’s radiant energy into a single beam in order to achieve very high temperatures. A simple example of what concentrated solar power is, would be a kid who uses a magnifying glass to focus sunlight onto a specific area below to produce intense heat. But this time the objective of the concentrator is to heat water and not ants or any other such luckless insects he finds. The temperature level that can be achieved using standard non-concentrating flat-panel thermal collectors is limited even with high-end vacuum tube collectors, but by concentrating the sunlight, very high temperatures can be generated at a specific point thereby greatly increasing the efficiency of the system with CSP being installed in both home and industrial applications. The concentration factor, also known as the “number of suns”, of a concentrating solar collector can be greater than 1,000 suns reaching temperatures at the focal point of the receiver (called the “target”) approaching several hundred or even several thousand degrees Celsius depending upon the size of concentrating dish and its solar location. The heat produced can then be used for conventional hot water or to produce super heated steam to turn generators. Concentrated solar power is simple in its design using reflective materials such as mirrors and polished metals. Solar concentrators can be quite powerful and the main types of “Concentrated Solar Power” systems are: Parabolic Troughs and Parabolic Dishes. 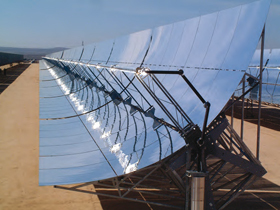 Parabolic Trough system, also called a line-focus collector, concentrates the solar power by using mirrors inside the trough to focus (or redirect) the solar radiation captured over the troughs large surface area and focuses it, or more generally “concentrates it” onto a central focal point to heat the fluid inside it to create hot water. The parabolic trough collector gets its name from the fact that the solar concentrator is a curved reflective trough which reflects the direct sunlight onto a single pipe or plate which contains a heat transfer fluid, usually water. The thermal pipe is positioned above the reflector at its focal point and runs parallel with it. The water which flows through the pipe is heated by the concentrated light and is then stored in hot water tanks. For commercial type concentrated solar power systems, a thermally conductive heat transfer fluid, usually oil, passes through a heat exchanger creating steam to run a conventional steam generator to produce electricity. Solar collector fields are created when these concentrated solar power collectors are modular which means that they can be linked together in rows to produce more hot water than can be created by an individual trough. Each parabolic trough can be tilted and is free to move so that it can track the position of the sun and maintain the focus of the suns radiation on the pipe throughout the day increasing the solar energy received by more than a factor of two which means more overall heat per square meter of solar trough. Parabolic Dish also known as the distributed-point-focus system uses a large, reflective dish similar in function to a TV satellite dish to focus light on a receiver that is positioned above the dish. The parabolic-shaped reflective mirrors concentrates the solar radiation onto a central focal point to increase the concentrated solar power. Like the parabolic trough concentrator, the parabolic dish is movable allowing it to track the suns position in the sky so that its incident rays are always perpendicular to the aperture area maintaining optimal focus. Water located at the focal point is heated and pumped into the home were the heat is released into the home and is returned to the solar concentration point to be reheated. The principal use of a parabolic dish reflector is to increase the amount of solar flux onto the dishes focal point producing a lot more thermal energy. Parabolic dish systems can also be used as part of another solar technology called a stirling engine generator. Both dish and Stirling engine system are used to generate electric power. We have seen that solar concentrators have polished or mirrored reflectors that focus sunlight onto a central point. Concentrated solar power (CSP) technologies concentrate solar energy to produce high-temperature heat that is then converted into electricity with parabolic mirrors being used for industrial, commercial, and home applications. But concentrating solar power of this type is not guaranteed and is not a 24-hour-a-day process as the sun does not always shine. Although concentrated solar power has many advantages over conventional flat-panel collectors or vacuum tube collectors for producing solar hot water, even the sunniest of places of the world have more than one days of cloud cover. Also, dust, birds, inclement weather, and intermittent sunlight all contribute to inefficiencies in this type of system resulting in increased cleaning of the reflective troughs and dishes. One of the main advantages that solar concentrators have over other standard solar thermal systems is that they require much less space. For example, if you can concentrate the sunlight at levels of 100 suns, you could potentially create a beam of sunlight that has 100 times more energy than that of normal everyday sunlight. This means then that a solar concentrator system which has 100 times sun magnification could potentially be 100 times smaller than a conventional solar thermal design. Concentrated Solar Power using either parabolic troughs or parabolic dishes do not burn any fossil fuels and produces zero greenhouse gas emissions during the conversion of the suns energy. They are also a proven technology and reliable. Solar concentrators have attainable maximum concentration which can be further increased with the use of more sophisticated or elaborate concentrators and tracking systems. To learn more about “Concentrated Solar Power”, or obtain more information about the various concentrating solar power systems available, or to explore the advantages and disadvantages of solar thermal power, then Click Here to order your copy from Amazon today about how to make your own Tracking Solar Concentrator. Awesome concept and idea. I like your ideas and your blog too for having so much information in here, thank you for sharing all of this! This is just a shot in the dark. I am looking for a parabolic reflector for an optical project at UC San Diego. If life were perfect the diameter would be about 80mm with a focal length of about 40mm. My google searches are coming up short. Any guesses where I should be looking? Thanks in advance, Gene. Edmund Scientific doesn’t have it. Great concept, very helpful. Thanks for sharing. Hi. Gas bill in winter has been quite expensive and as the Earth is cooling and prices are going up it will be more and more expensive every year. I was thinking whether it would be possible to home-manufacture a device to heat a home using the parabolic mirror (like the one the kid did with 5800 mirrors) to heat a home. What could be the components?